And Happy one-year anniversary of this blog! I can’t quite believe that it’s been an entire year but apparently it has – many new recipes were tried, much delicious food was eaten, and so it shall continue! In honor of the one-year anniversary, this week, I am posting two recipes, instead of one. Pannukakku: As I continue to explore other countries’ foods, I’ve come across some interesting names, and solid dishes. This one was described as a Finnish pancake, but in reality it is a Finnish Yorkshire Pudding. I found the recipe on NPR’s wonderful food blog Kitchen Window. Butter a large 8X8 baking dish – I leave the little chunks of leftover butter in the pan, as it will just melt. Mix together the egg and milk, then add the salt and flour and whisk until smooth. Let the batter rest for 10-15 minutes, while you pre-heat the oven to 425. Pour batter into the prepared pan, and bake for 20-30 minutes. The result is a lovely light and fluffy yorkshire pudding (essentially). You can serve it with sweet or savory toppings. 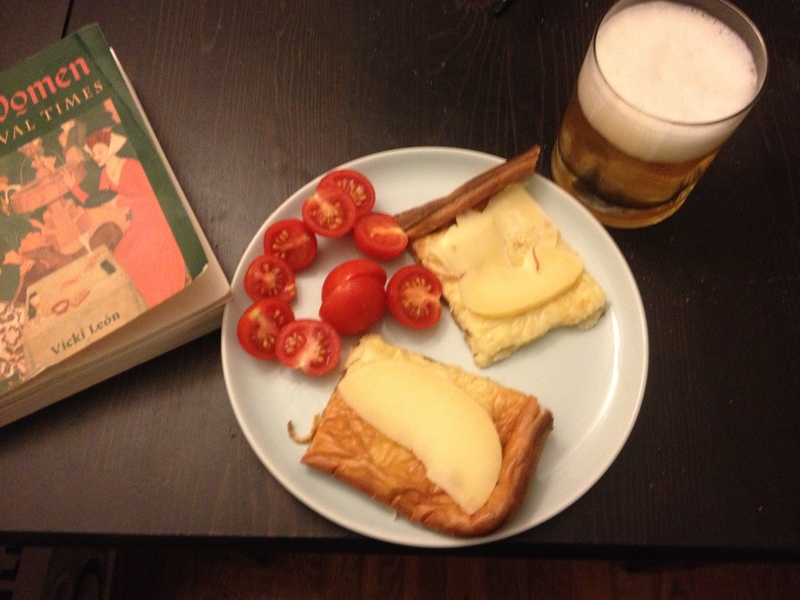 I chose cheese and tomatoes, and washed it down with ale (a farmhouse saison ale to be specific). Easy, fast, few ingredients, and endlessly versatile. All in all a great choice for a quick weekday meal. Beer Rice: This sounds weird, I know, but it worked surprisingly well. It is, in essence, rice cooked in beer, along with a few other ingredients. I got this recipe from the cookbook Students Go Vegetarian, which as you can guess, is designed for people with limited money and time and a general liking of beer. I tend to find its recipes fairly bland, so naturally I improved upon it. Saute the chile, onion, and garlic for a few minutes in a medium saucepan (absolutely a saucepan). After the onion begins to soften, add the coriander and cumin. Saute for another minute. Then add the rice, water, and beer. Its important to use a beer you like – not a beer you want to get rid of – as the flavor will remain. Bring the rice to a boil, then cover, lower the heat, and let simmer for 40 minutes or until the rice is done. 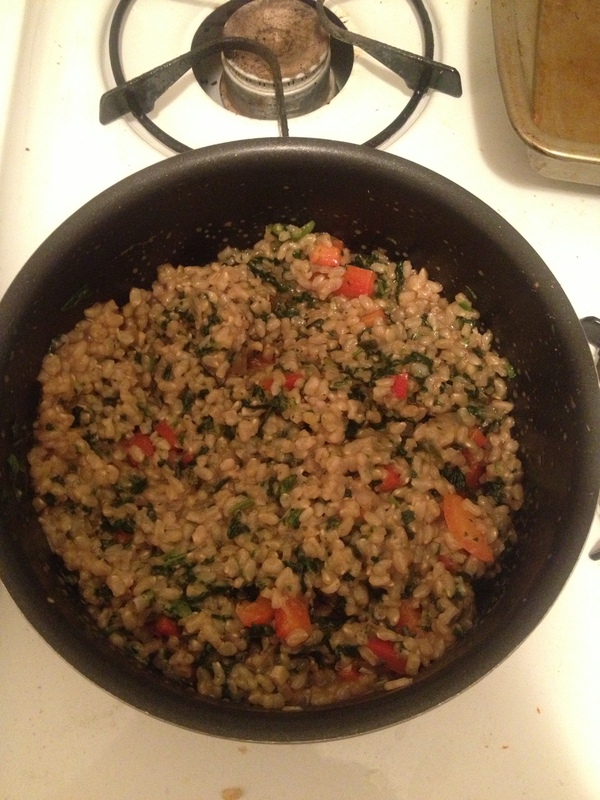 Once the rice is done, add some red bell pepper and some spinach, and cover again so the bell pepper cooks a bit. This one tasted good, but a bit weird to me. Not bad weird, but more “hmmm, interesting, how do I feel about this?” weird. I think its due to the coriander – I rarely cook with it, and by that I mean I bought some for the first time today. This dish makes a lot, and its fairly dense/filling, so you don’t need to worry about a side dish, or needing to make a lunch for work the next day. Also, you can probably add more veggies if you want. Naturally you should serve this dish with some of whatever beer you were cooking with!